Yrvind is back home. There is many things to sort out, for example to get a new internet connection. As soon I am settled I will start working this site and build a new and better boat called Exlex Minor with a length of 5.8 meters, beam 1,23 meters, draft of hull 0,2 meters and displacements loaded for 60 days at sea, 800 kilos. That will give approximately 5000 nautical miles. The idea of this boat will be presented on this page. The core is now done and she came out with a 5.6 meters or 18.4 feet waterline. With a load of 0.8 tons her displacement lenght ratio will be 130. A condition for a boat to plane is that her displacement length is less than 150. Two of the tourist’s means of conveyance are the recreational vehicle and the bicycle. The RV gives its owner comfort and speed. It has beds, kitchen and a shower. If it starts to rain, there are windshield wipers. The cyclist uses a simple and environmentally friendly form of transport. He sleeps in a tent and eats outside, but cycling is sweaty work and during heavy rains he gets wet. Furthermore, compared to the RV he does not get far in a day – despite his feeling of speed. But, cyclists do not get fat, nor do they get bored- their bliss comes from within. Bike trips are known to be healthy and mentally enriching, therefore even people who can afford a RV go cycling. At sea it’s different. 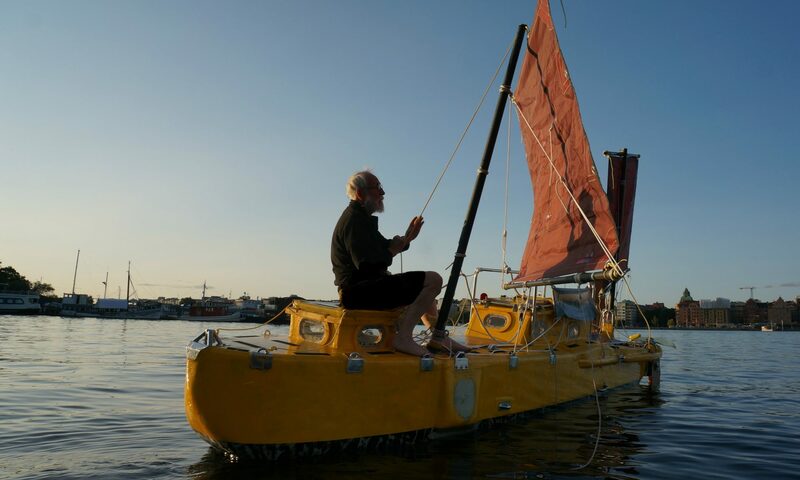 Although people paddle kayaks and sail small boats along coasts, normal people only cross oceans in big boats with beds, a kitchen and shower. If a small boat sailor leaves the coast he is deemed mad. If he successfully returns to land after having crossed an ocean, he is hailed as a hero. But what he has done is not madness or heroism, because the oceans are waste regions of wilderness, stunningly beautifully in their ever-changing magnificence. To roam them in a small, safe, environmentally friendly boat, propelled by wind and muscle-power is healthy and mentally enriching. I must stress the importance of safety because the sea is ruthless in its fury and the small boat, far out to sea, has no place to hide. Alone, without help, it must be able to survive storms of the worst kind. Some things are inherently dangerous. Fires, electricity and cars can hurt you, but we have not done away with them, we have made them safer and developed better ways to handle them. Ocean-going production boats are big not because bigness makes them safe, but because there is more money in big than in small boats, and much money spent gives the owners status. Exlex Minor aspires to be the mountain bike of the oceans. It’s a new product and a product much needed. Today people wishing to enjoy the beauty of the oceans are obliged to use big expensive deep draft boats equipped by heavy diesel engines. Exlex Minor is different. Here I will describe the Ideas behind here from time to time. Be patient because I will also work on the boat. This is a start more will follow. I take the opportunity to thank everyone who has contributed to my last project, because at sea I been unable to express my gratitude. A product should be suitable for its intended use. That a production cruising boat should be suitable for cruising seems so obvious that few persons question it, but cruising boats are not produced to be cruised in, they are produced to make money for the producer. There is more money in big boats than small boats. Hence the producer tries to sell big boats. He does not care about what you need. He cares about making big money. This behavior is accepted in our consumer society, but that does not make it right. Do I put the blame on the producer? Yes but only partly. The consumer has also a responsibility. He can get more informed. If he did not consume to impress his fellows the producer had no reason to build big boats. I also blame the yachting press for not writing about these important things, but of course they like the money they get from the boat producer. Does this mean that producers and journalists are bad people? Far from it, I know many really nice commercial boat builders and journalists. They treat women well and care about the environment. It’s the economical situation that causes problems for our limited world. A sailor needs a suitable boat! If he cannot trust the producer who then can he trusts? Choosing a cruiser is a two part complex and difficult process. First you should know what is really suitable for you, then you must find out what boat really has those desirable properties. May be you like to have a boat with all the comfort the salesman is tempting you with, but comfort works only in the short term. The only way to get energy is to use energy. Persons enjoying comfort gets robbed of their energy, they become lazy and fat, and they lose their health and get bored. A small boat with less comfort is a better choice. But what is a small boat. The shorter a boat is, the smaller it is. That is the commonly accepted consensus. Despite the inconsistence, for convenience sake, – its easier to measure length than to weigh a boat, – length has become the measure of boats size despite the fact that weight is much better. Having chosen length, producers put into that length as much speed and comfort as possible. The result is boats that make a lot of resistance. Exlex Minor is designed along a different idea. I have chosen a desirable speed 4.3 knots and then designed a hull long enough so that my boat at that speed she will make very little resistance, in fact she needs only about 18 % of the power a ordinary boat uses, because she slower for the same length. Now comes a difficult abstract concept. If my boat is passed by a boat of the same length that sails much faster I must not be angry because I must keep in mind that also my boat could have been designed to sail faster had I chosen to. If I had given her 6 times more power she could have been 1.4 knots faster. She could have made 5.7 knots instead of the designed 4.3 knots, but to gain those extra 1.4 knots the 6 times more sail area had to be placed higher up, that means a that each square meter up there would have had much more healing moment, not to mention the taller mast. To carry all that sail and the gear like winches to control it the hull would have had to be equipped with a deeper and heavier keel. The boat had then become so heavy that she had needed even more sail area. I would have been in a vicious circle. A small sail is easy to handle. Big sails in strong winds are demanding. My choice is tranquility, shallow draft and beach landing capability that gives me access to thousands more destinations. My choice is an economical boat that can be propelled by muscle power. In my opinion, speed is desirable, but it is overrated. For more about the low energy concept see my Manifesto in English and Swedish. I intend to test Exlex Minor rounding Cape Horn from latitude 50° south in the Atlantic Ocean to 50° south in the Pacific Ocean; east to west. This is original meaning of a Cape Horn rounding, like the ones my father and my maternal grandfather did in their youths. In those days sailors knew that rounding the Horn from west to east was much easier because the ship was helped by the east going current and it was downwind, even a piece of driftwood was capable of that, on the other hand, had you rounded the Horn from east to west you could place a feather in your cap because an east to west rounding was not easy. I have no memory of my father. 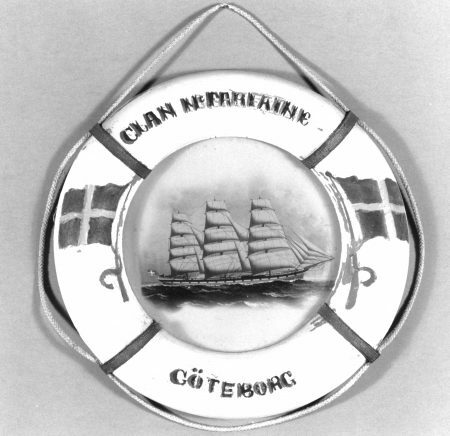 15 January 1940, when I was 8 months old, he left Göteborg as first mate on one of Sweden’s most modern cargo ship Ningpo. I never saw him again. The English sunk his ship in Hong Kong saying it would be good for the war. My grandfather who had been captain on the same ship just survived the war in China under Japanese occupation. He came back to Sweden after the war gaunt and sick. After he had had been in hospital for half a year I saw him for the first time. He was a hardy, silent man that did not speak much, especially not to children, but now and then a few words let my know of the hardship he had been through, during the war in China and sailing square riggers in all kinds of weather. He had gone to sea 13 years old. At 18 he was back in Sweden. In his seaman bag was purse containing gold coins he had saved as a young seaman. That money saw him through navigation school. He came out best in his class. His favorite subject was mathematics. He served as a Captain on screw steamers and then later on motor vessels, but his heart was always with the tall sailing ships. Many years ago I also rounded Cap Horn. No Swedish single hander had done it before me; it was an east to west passage. Monday 16 June 1980 I was due south of Cape Horn. It was winter down there. The cold, the dampness, and the darkness were hard, but the most difficult part was the navigation because it had to be done with just the sextant. The sextant is a fantastic instrument it gives a position with an accuracy of about 3 nautical miles, that is 5000 meters, from a rocking ship by observing the heavenly bodies. The modern GPS is much more accurate. It can give you your position within 5 meters, 24 hours a day, seven days a week. This is 1000 times more accurate than the ancient sextant. This is an enormous help because during high latitude sailing, especially in the wintertime, the sun is seldom out, and when it is out it is very low in the sky. The altitude of my observed sights at noon, south of Cape Horn were around 11°. Of course this number means nothing to a person without an education in astro navigation, but if you navigate by the book you should discard sight less than 20°. I love to return to Cape Horn equipped with a modern instrument like an Ipad with built in GPS and a downloaded chart; then most difficult problem with such a passage would be solved. Bris, the boat I sailed Bris was only 19 feet or 5.9 meters long the smallest boat ever to round the Horn, but she was heavy and beamy and had 150 cm or 5 feet of draft. 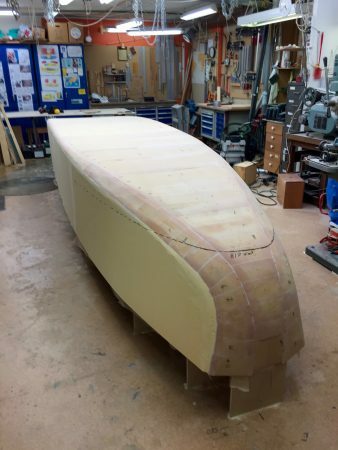 The boat I am building now, Exlex Minor has less than half Bris beam and draws only 20 centimeters. As for myself at that time I was young and strong, my age was 41. When Exlex Minor is ready for the oceans I will be twice that age. Will more knowledge and a better design compensate for me now being an older man and that Exlex Minor has a fraction of the previous boats displacement? I think so; I think it is doable. I see no reason not to try? What is my alternative? Chose an easier life? Not for me, my life loses meaning in proportion to how comfortable I chose to live. For me a life without struggle has no meaning. What can I lose by trying? I am full of fighting spirit and by spending my energy on something purposeful I get it back with interest. However much I like to round Cape Horn, my desire is not the important thing; the important thing for humanity is to show that Exlex Minor is the Mountain Bike of the Oceans and that she can survive and go to windward in any weather if handled by a competent crew; that those big expensive boats are only good for impressing your neighbor. If I can succeed to convince sane people of that she Exlex Minor will, in a small way, contribute to a better world, a world less polluted, a less wasteful world and the persons sailing these small boats will be happier and have better health. Symbolically, hopefully this will inspire folks in other walks of life to lead saner life’s. Frequently asked question: When will I start sailing. Its hard to tell how long a time it will take to build something that never have been built before. Time shall not dictate the speed of building. The quality of the work comes first. A rough guess is about two years for building, maybe one more year for fine tuning. I work on a very limited budget so your contributions will speed things up. Today racing yachts strives for a wave piercing bow. To slice through a wave instead of having to fight your way through it sounds like what a strong man should do. Racing yacht and cruising yachts are different kind of boats. A racing boat is often built light and driven hard to windward a cruising boat is heavier and the sailing is more relaxt, its course is mostly downwind. The ocean sailing yacht may not have such a high average speed but out on the ocean there are big waves and in the trough, sailing downwind, there is a counter current often 2 to 3 knots fast if you add that speed to the average speed you are in a high Froude number speed range and need a high prismatic not wave piercing bow. One more thing sailing fast down a wave and meeting a counter current is to ask for a broach. A spoon bow reduces the risk of broaching. Further a spoon bow increases a boats initial stability as it makes the boat wider in the bow than the wave piercing bow and it’s the beam integrated over the length of the boat that is the initial stability. A boat at hull speed. The bow wave and stern wave have created trough in wich the displacement boat is trapped.